Barthelona, San Vincenzo and The Delphi represent Ballymore Stables on Benalla Gold Cup day on Friday. The Delphi is the first to go in the third race, a Maiden over 1606m and Mike Moroney has added blinkers to the son of Makfi. “He’s drawn well and he’s as fit as we can get him plus we’re anticipating the blinkers will switch on,” Moroney said. “He has struck a very strong maiden which is not ideal but if our horse brings his best form then I’m sure he will be competitive. 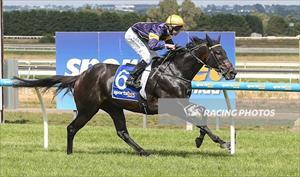 San Vincenzo (pictured) is resuming and starts in race six, the Benchmark 70 Handicap over 1406m. “Like The Delphi he’s copped a strong field and first-up I’m thinking they might be a bit sharp for him,” Moroney said. Barthelona is in the second last race of the day, the Benchmark 78 Handicap over 1206m where he is drawn the outside of 14 runners. “We’re not too disappointed about the barrier as we’ve found now that if you ride him back he has a turn of foot at the finish,” Moroney said. “That said, he’s got the gate speed that if he did fly the lids he can cross. “He doesn’t seem badly treated at the weights and if it turns into a fast run race we envisage him sitting off the speed and then finishing over the top of them.